Members of the public are invited to join area naturalists and their colleagues for the 2014 "BioBlitz" that will focus on biotic interactions, such as the critically important role of pollinating insects, at the Adirondack Interpretive Center (AIC) June 29. Participants will help conduct a scientific inventory as they learn how these interactions promote biodiversity in the Adirondacks and worldwide. They will learn where to look for relevant species and how to identify them while helping track the health of the natural environment. The event will explore lakeshores, marshes, forests and other Adirondack habitats. The event will also include a presentation by Sam Droege, a 1986 ESF alumnus who is a world-renowned bee expert with particular interest in macro photography of these essential insects. Droege is now a biologist with the U.S. Geological Survey Patuxent Wildlife Research Center. 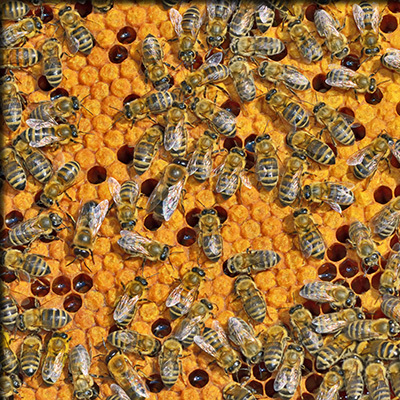 At 4 p.m., he will demonstrate special photography techniques to reveal intricate details of bee morphology and beauty. A bioblitz is a rapid inventory of organisms-common or rare, large or small - in a defined area. The event at the AIC, part of the Newcomb Campus of the SUNY College of Environmental Science and Forestry (ESF), is associated with the Adirondack All-Taxa Biodiversity Inventory (ATBI), a group of professional and citizen-scientists from across the region that has hosted bioblitzes in the Adirondacks for seven years. The ATBI helps people learn more about the diversity of life in the Adirondack Park. "As a co-founding partner of the ATBI, SUNY-ESF's Newcomb Campus is pleased to host this year's BioBlitz. It's a thrill to watch young people mixing with expert naturalists; such excitement is in the air!" said Stacy McNulty, associate director of ESF's Adirondack Ecological Center in Newcomb. Focusing on pollinators and biotic interactions highlights the role these insects and processes play in nature. Many of the plants that grow in the forests or in our own backyards are dependent on insect pollination. Pollinating insects represent one of the countless biotic interactions critical in shaping the natural world. Many of these biotic interactions are under threat from stressors including climate change and chemical pollutants. "As the climate changes, many of the organisms that interact with one another will be affected and, unfortunately, some of them will decline. We need to start documenting these changes to see if we can take actions to protect ecosystems," said Ezra Schwartzberg, a 2001 ESF graduate who is director of Adirondack Research, LLC. This free day of fun and educational events, which will also include topics such as mushroom identification and salamander sleuthing, is open to people of all ages. Youngsters will have the chance to go on a naturalist scavenger hunt around the interpretive center while older children and adults can join teams of experts heading out into the surrounding area to sample different groups of organisms. A master gardener will talk about plants that attract native pollinators. No scientific experience is necessary for those who wish to participate. Activities start at 8:30 a.m. The Adirondack Ecological Center of the SUNY College of Environmental Science and Forestry and the Center for Adirondack Biodiversity at Paul Smith's College offer this event with support from the U.S. Geological Survey, Adirondack Research LLC, and area naturalists. Please contact Dr. Ezra Schwartzberg ezra@adkres.org for more information about the event or visit http://adkres.org/2014-bioblitz/ for details.